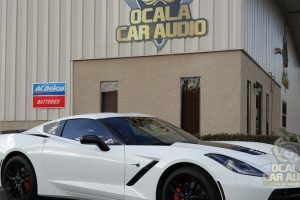 When it comes to creating an audio system that sounds amazing, incorporating a digital signal processor into the system gives your installer the tools required to compensate for the majority of the limitations that vehicles impose. To maximize the benefit, a digital signal processor system design needs to take the features and benefits of a processor into consideration. In this article, we are going to explain some of the key differences between a system with and without a digital signal processor. A digital signal processor, also called a DSP, is an audio processor that uses a microcomputer to make adjustments to a signal in the digital domain. In a stand-alone processor, the audio signal from the source unit is converted to a digital data stream using an analog-to-digital converter. Once in the digital domain, the processor can equalize, filter and even delay the signal. Most processors have six or more output channels to provide us with the ability to send different signals to dedicated amplifier channels. Each channel has a digital-to-analog converter that provides a conventional analog audio output. Digital signal processors offer many benefits over their analog brethren. All the adjustments are handled in the digital domain, making the system impervious to errors because of differing passive electronic component values. The range of adjustability is much greater in a DSP compared to an analog processor, and because all the calculations are based on mathematical equations, the results are more accurate and repeatable. Such functions as signal delay can be performed much more easily in the digital domain than by using analog components. 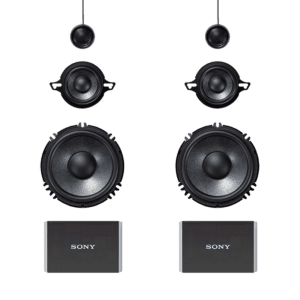 A three-way speaker setup like the new Sony XS-GS-1631c would be a great choice for a DSP-based system. Your choice of speakers and subwoofers is independent of the presence of a signal processor. The criteria for accuracy, clarity and output capability doesn’t change at all. What will change is whether or not you need passive crossover networks. The job of a passive crossover is to split the audio signal coming from your amplifier into frequency bands that are suitable for the woofer and tweeter in your speaker set. It should go without saying that the tweeter won’t be able to reproduce mid-bass and midrange information accurately, and the woofer can’t handle high-frequency information. Passive crossover networks use a network of capacitors, inductors and resistors to split up the signal and send it to the appropriate driver. To this point, we have been talking about component speakers. We can certainly build an amazing audio system that uses coaxial-style speakers. 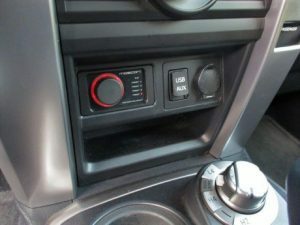 Coax speakers are very common when a speaker location in the dash can accommodate a four-inch driver, and many people choose coaxial speakers for the rear locations in their vehicles as well. When we design an audio system that will be using a digital signal processor, we can use that processor to divide the audio signal before it is sent to an amplifier. The drawback is that you need additional amplifier channels. The benefit is that we have complete control over the crossover slope and frequency for each driver. This flexibility to adjust the interaction between drivers in adjacent frequency bands allows us to ensure that the output of both drivers sums accurately where they overlap. Done correctly, the transition from one to the other is smoother. A DSP can help provide some flexibility in speaker placement. In most cases, we install upgraded speakers in factory locations in the doors. The tweeter is often placed at the top of the door, or in the dash. Depending on your vehicle, this may put the tweeter closer to the listening position, or farther away. Another consideration of installing an audio system in a vehicle is that we sit much closer to the left side of the car than the right. This means that the left-side speakers are perceived as being louder, and we hear the signal from them before we hear the one created by the right-side speakers. The result is a soundstage that is clumped to the left side of the vehicle. All digital signal processors include the ability to apply a delay to the signal output from each channel. We can use this delay feature, along with some simple calculations, to allow you, the listener, to hear the output of both the left and right speaker at the same time. The effect is much like listening to a high-end home audio system where you sit equidistant from each speaker. Executed properly, your music will appear to come from a virtual soundstage that spans beyond the width of your windshield. With some additional tuning, we can adjust the arrival time of the entire front stage to compensate for the distance to a subwoofer. 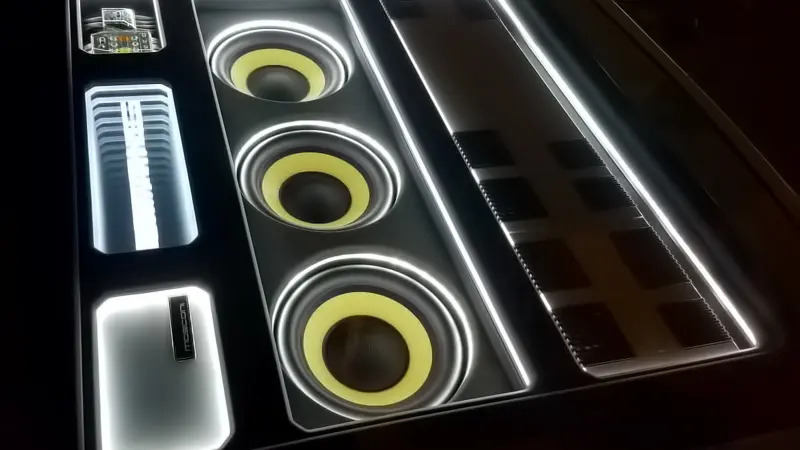 When adjusted properly, the sound from the subwoofer will appear to come from the front of the vehicle, assuming you are using premium quality, low-distortion subwoofer. We mentioned that sound systems that are designed using a digital signal processor often require additional amplifier channels. Most manufacturers offer four-, five- and six-channel amplifiers, and several even have eight-channel amps. These multi-channel amps are ideal for actively filtered audio systems. A five channel amplifier such as the new Mosconi Pro series can provide an excellent base for a DSP powered system. In the simplest of systems, we can use a five-channel amp with a digital signal processor to power a set of tweeters, a set of midrange drivers and a subwoofer. For more complex systems, you may want dedicate midrange drivers on the dash and mid-bass drivers in the door, so you’ll need another pair of channels. If you like having rear speakers, tack on another pair of channels. 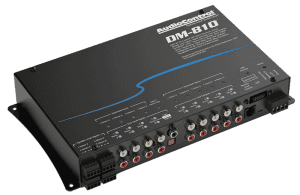 You may find it ideal to combine a six- or eight-channel amplifier with a dedicated subwoofer amplifier to achieve the correct number of channels and precisely the amount of power you want. 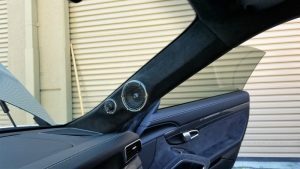 Another huge benefit of using a DSP in the system is that it gives us the ability to equalize the signal going to each speaker to compensate for reflections and resonances in the vehicle. Speakers have different response curves at different angles. As a result, a speaker will seem to sound different depending on where it is installed. Almost all DSP companies offer some sort of DSP controller, like this Mosconi Mini controller. Another benefit of building a system that includes a digital signal processor is the ability to factor multiple configurations into the design. Many processors include multiple presets that can be accessed using an optional remote control or a simple switch. 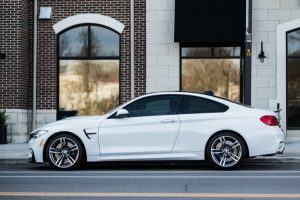 We could configure one preset to provide the driver with excellent imaging and a second configuration designed to be used when there are multiple people in the car. This second option would remove some of the signal delays. The accuracy and placement of the soundstage would suffer somewhat for the driver but improve dramatically for the passenger. 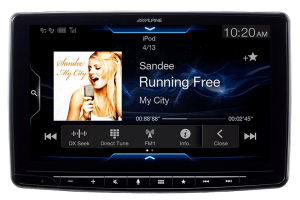 If you are designing an audio system upgrade from scratch, talk to your local car stereo shop about including a digital signal processor in the system and be sure to include an hour or two of labor in the quote for tuning the system once it’s installed. 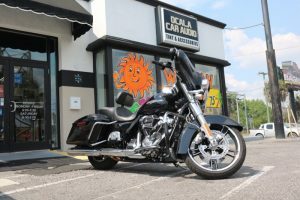 If you already have an upgraded system, drop into your local mobile enhancement retailer and ask them to demonstrate the benefits of a digital signal processor. When configured properly, a DSP can make your existing audio equipment sound better. 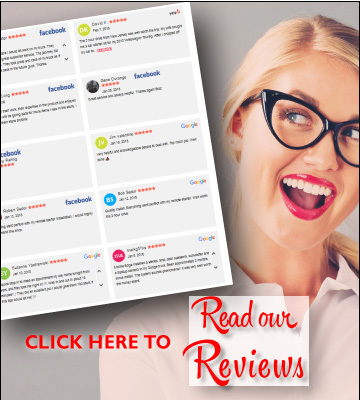 We know you will be impressed!